With the charm of Old Lahaina town right at your fingertips, these Maui vacation rentals provide a quiet getaway without being in the thick of the busier down town areas. Only minutes away on foot from award winning restaurants, the classic Lahaina Cannery Mall, and the local favorite Puu Noa (Baby) Beach, these Maui condos are a perfect location to explore all that the famous Front Street has to offer. Watch the sky light up at sunset (and maybe even catch the 'green flash' at sunset!) while lounging by the ocean front pool. ​Walk to Baby Beach in Lahaina or walk to some of our favorite restaurants located on Front Street just ¾ miles away from Lahaina Roads: Mala Ocean Tavern, Honu or Frida's Mexican Beach House all located on the water with amazing views! Easy shopping options close by at the Cannery Mall with a Safeway grocery store and the newest shopping mall: Outlets in Maui. This remodeled 2nd floor two bedroom, one bath Maui vacation rentals has Direct Ocean Front Views. Located at Lahaina Roads on Front Street is one of the best kept secret in Old Lahaina Town! Pride in ownership is reflected here in Unit #201. This vacation rental features a king in the master bedroom with 2 twins in the guest bedroom with a sofa sleeper in the living room for a maximum occupancy of 5. Condo feature a Tri-Zone AC system with a cooler system in each of the bedrooms + one in the living room. Condo also offers Free secure Wi-Fi internet access, free local phone calls and free parking. Imagine Maui. Relax and/or play in this vacation rental resort with a residential feel. This boutique complex is one of the best-kept secrets on Front Street in Lahaina Town. With the ocean at your doorstep, you have front row seats for the turtle watching, seasonal whale watching and year round sunsets. Relax on your private lanai, or socialize at the pool and barbecue area. During the past year major renovations and improvements have been made to the entire property. Come see for yourself and find out why this resort has repeat guests year after year. Free covered parking and Wi-Fi. Lahaina Roads unit #204 features a full kitchen, flat screen TV with basic cable, Ceiling fans, Washer and Dryer, 4 guests maximum occupancy please. Located on the ocean side of Front Street. Walking distance from Old Lahaina Town (1/2 mile) Cannery Mall, Starbuck's, Safeway, and the Old Lahaina Luau - only 2 blocks away. Newly Renovated luxury bathroom with tiled walk-in shower (no tub).Private lanai overlooking the ocean (25 feet away). Fully equipped kitchen. Free onsite Parking (1 unassigned spot/unit). Enjoy the spectacular sunset views while eating dinner on the lanai. Watch the whales play in the winter. Giant sea turtles come right up to the seawall to feed. Ocean front in Lahaina Town. There is a step up into the bathrooms walk-in shower/tub and commode. 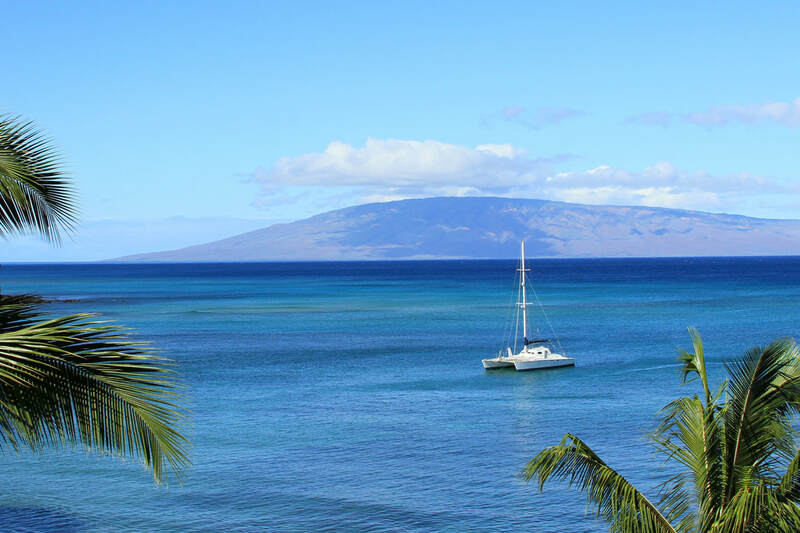 Wake up to the sound of the ocean and the beautiful views of Lanai and Molokai. Bring your laptop and access the internet from anywhere in the condo. Ocean front in Lahaina Town just moments from shopping and dining on Front Street. Entertain in the evenings on the 26" flat screen TV and DVD player in the living room. The king size bed can be made up into two twins upon request. Remodeled kitchen and bathroom. Large walk in shower has a grab bar, no tub. Ocean front penthouse in Lahaina Town. Unit air conditioners in the living room and both bedrooms keep you cool without the need for ceiling fans. Brand new sofa sectional as of June of 2015. A CD player has been added to the living room so bring your music from home. Large wrap around lanai extends from master bedroom side around to the front off of the living room and dining area. Bring your laptop and access the internet at no charge.